This spirited, music-driven movie introduces an unlikely ensemble of five students -- Olivia, Wen, Stella, Mohini and Charlie – who, after meeting in detention, gradually realize their shared musical connection and belief that it's time for the students of Mesa High to stand up and be heard on things big and small (ranging from the school Principal's exclusive support of the athletic programs to the removal of the popular organic lemonade from the cafeteria). Ultimately, as they open up to each other and form friendships, they start a band -- Lemonade Mouth -- that soon resonates with students sidelined by the high school elite. However, not everyone in the school is ready to cheer them on, especially since the popular rock group Mudslide Crush is determined to maintain their headline status and win the coveted Rising Star music competition. Based on the book Lemonade Mouth by Mark Peter Hughes and directed by award-winning Patricia Riggen (La Misma Luna aka Under the Same Moon), executive-produced by Debra Martin Chase (The Sisterhood of the Traveling Pants, Disney Channel's "The Cheetah Girls" movies), co-produced by Gaylyn Fraiche (Just Wright, Sisterhood of the Traveling Pants 2) and choreographed by Chris Scott (TV’s "So You Think You Can Dance"). In addition to featuring 10 awesome original songs from the No. 1 soundtrack, the exciting LEMONADE MOUTH: EXTENDED EDITION DVD release includes an exclusive extended performance of "Livin’ on a High Wire" and an exciting "Rock-Along" version of the movie that allows fans to sing along, with lyrics to all the songs, appearing on-screen. Both features are available only on the DVD that debuts in the US on May 24, 2011 (Canada on May 17, 2011). Both of our children adore music and the Lemonade Mouth music video's that they had previewed on the Disney Channel really helped to fuel their excitement about the movie! We all sat down to watch Lemonade Mouth on DVD last week for our movie night. The kid's were captivated by the inspiring story line and incredible songs that both motivate & inspire children to reach for their dreams and never give up! With several songs performed throughout the movie, the kids were frequently off of the sofa dancing and singing along. Adding to the entertainment value, I love that Disney has included a digital copy with this title. The digital copy was easily downloaded into our iPad, perfect for on-the-go entertainment (great for our next road trip!). Teaching and inspiring children to never give up, Lemonade Mouth became a fast favorite in our home, I'm positive it will in yours as well! 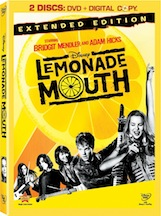 You can find Lemonade Mouth on DVD at a retailer's online and near you on Tuesday, May 24, 2011. Leave a comment~ What is your family's favorite Disney Channel Original Movie? The comment is considered your entry. Entry to this giveaway ends at 12pm PST June 7, 2011. Winner's are chosen randomly through random.org.The winner will be announced in a post within 7 days of the giveaway ending, and contacted through email. The winner will have 48 hrs. to respond or another winner will be chosen. My family is all about the High School Musical movies. I like Swiss Family Robinson. Old, but classic! Probably Wizards of Waverly Place would be the fave. My favorite is Mary Poppins. Thanks. I forgot to say that I follow you on GFC in first comment. I would also have to say the High School Musical series of movie. My DD loves them!